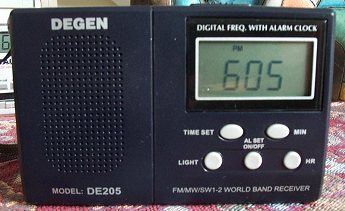 In this latest round of radio comparisons I focused on the least expensive digital readout World Band models I could find. They cost between $9.99 and $24.99, although with shipping the real price jumps to $16.99 to $35.99. These radios are all analog-tuned with digital readout, which is a very recent development at this entry level price. All but the Tecsun R-333 are tiny pocket portables of Walkman size…the GP-4/GP-4L at 3.4″ x 2.55″ x .83″ is even smaller and is advertised as the world’s smallest digital SW portable. The R-333 turns out to be a somewhat larger box measuring 8.5 x 5 x 2.5 inches. In terms of size it doesn’t fit into this group of pocket portables, but it does belong by virtue of it’s price and features. It’s a good, inexpensive “around-the-house” radio…kind of a half-sized version of the Grundig S-350. It would also be easy to pack into luggage as a handy travel set. The other, much smaller units are ideal for backpackers, joggers, walkers, for the briefcase…anyone who wants to really take their radio with them. These are the best prices I found in February of 2005…they vary slightly from time to time. All were purchased online. 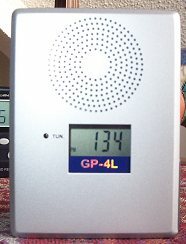 *The GP-4L seems identical to the previous GP-4 with the addition of an emergency light. I compared the two versions together and determined that their operation was otherwise identical. Frequency Coverage: All of the Chinese versions omit the expanded AM band from 1610 to 1710. All except the R-333 (which has two continuous bands from 3.90 – 18.0 MHz) cover the major SW bands but have some gaps between them. I won’t detail all the frequency band specs here, but they are available easily online. But do be aware that all the radios in this group bottom out at about 5800 MHz on shortwave…no 60 Meters or below. These models are somewhat finicky to tune in, especially on shortwave where knob movements caused much larger swings in frequency than on AM or FM. It can be challenging to end up with the exactly correct frequency displayed…you have to learn the feel of the tuning system and apply varying pressure in each direction to wind up perfectly tuned. The R9702 and DR-910 were slightly easier to tune on SW than the others…the R9702 because of an unusually smooth feel and slow tuning speed of the tuning knob and the DR-910 because it’s 8 bands of shortwave spread the frequencies out much more than the two shortwave bands of all the others. The R-333 was somewhat fiddly on AM and quite tough on FM, but once you get close with the course tuning knob you can fine tune with the fine tune control. Still, with two tuning speeds, the course speed is WAY too fast and the Fine Tune has limited correction range…it’s not continuous…it’s a 270 degree pot…so you have to get fairly close with the Main Tuning first. Also, the R-333, DE205 and GP-4L leave off the last digit on the frequency readout on shortwave, so 6195 shows as 6190 or 6200. Not a huge deal really, and still much easier to find stations with than the analog models which formerly were the only choices anywhere near this price range. All have a clock and timer function as well as LED display illumination except the GP-4L which offers an emergency light instead. (The earlier GP-4 was identical but lacked the light). None have any station presets as they are analog tuned. All the small sets showed significant hand capacitance effects…generally weak stations were received far more loudly and clearly while I was holding the radio. Put it down on the table and a weak signal may fade out. The R-333 was the best here…possibly simply because it is a bigger set. As a group they all seemed surprisingly solid…at these low prices they offer very reasonable build quality. None are supplied with batteries or ac adapter. 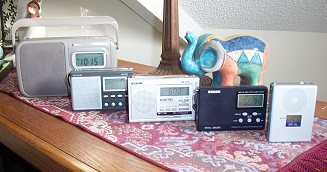 The largest radio is the best for general around-the-house use by far. It gets the best reception and has the biggest, most powerful sound. Its 3 D cells should last a very long time…possibly the reason why this is the only tested model that lacks an external DC input jack. It could have been more use friendly if it had slower ratio tuning…the unit’s biggest drawback. This radio is also labeled in Chinese, but the few controls are quickly figured out with a few moments use. It also has a Tune LED which is marginally useful, and a separate Fine Tune control which has limited effect on AM but is essential on SW. This radio’s gray case with rounded corners looks more like a typical AM/FM portable from the 80′s than any of the other sets, but what it lacks in high tech appeal it makes up for in a high performance versus price ratio. A comfortable folding handle is also a nice touch. No Stereo FM. I used the R-333 for a week in place of my trusty Grundig S350 and didn’t feel particularly short changed. It didn’t match the S350 overall but still I was able to listen to most of what I’m accustomed to hearing. You could do a lot worse than the R-333. An oddity with this model is that evidently, the Chinese DR-910 version does not produce stereo FM at the headphone jack, but the Grundig G1000A version does. It is unusual for this sort of feature to be added for the import version and is one good reason to opt for this version rather than the Tecsun version if you care about stereo FM. I discovered that the downloadable English manual for the G1000A shows an FM Stereo LED where my DR-910 has a Tune LED, which functions on all bands. Also the only model in this group to divide the shortwave spectrum into 8 bands, making SW tuning by the thumb wheel much less touchy and critical. However the AM tuning is quite touchy. Also has just a slightly sharper sound quality than the R9702 below…sometimes I liked the extra clarity, sometimes the mellower R9720 made noise a little less bothersome. Almost unbelievable at this price, this is a true dual conversion receiver. The R9702 should have fewer problems with images (“ghosts” of signals showing up at other than their actual frequencies). Occasionally the R9720 seemed to exhibit a bit less background squealing and birdies than the others. It’s two-tone gray and silver coloring is unique as is the smooth silky feel of the tuning knob. It also has a relatively slow tuning ratio, so although this is one of the two band SW radios in the group, it is not very touchy to tune in exactly. One annoying trait is that this unit always reverts to FM when you switch it on…an annoyance for me. Only radio in this review to produce stereo on FM through earbuds. This model also has an unusually large and bright red power led…no mistaking when this one is on! Elevation panel is not hinged on the back panel as is the norm but is a separate plastic piece that is slid into a notch on the back panel. It is tethered to the carry strap so it won’t get lost. A slightly less convenient arrangement than usual but once in place it works ok. SW/FM rod antenna exits to the left so cannot be swiveled to the right. A notch smaller than the previous sets, the DE205 is also the cheapest by far. It also brings up the rear in overall performance. It suffers from an annoying buzz, (probably from the frequency display) especially on AM, which limits weak signal sensitivity. Unless you really need the smaller size or need the cheapest digital readout radio available the performance tradeoffs are probably not worth it for any real listening. For $17 delivered it is far better than the cheapie analog Bell & Howell or Lifelong radios generally available for about $10 plus tax and/or shipping. It sounds weak and a bit hissy but will bring in the stronger signals and you’ll know what frequency you’re on without guessing like on the cheap analogs. Tiniest of all, this is advertised as the smallest digital readout radio available, and as far as I know that claim is true. Performance and ergonomics are similar to the DE205…SW reception is slightly better than AM, but as with the DE205, only strong signals are likely to be worth listening to. But the size factor makes this a neat gadget if that is what you want, and it’s small enough to fit comfortably into a shirt pocket. When using earbuds their cable can substitute for the whip antenna (on FM only)…a convenience for pocket use. While the front panel reveals only the digital display and speaker grille area, the controls are on the sides and rear, with ALL the labeling on the rear. The front panel contains a tune LED … marginally useful. I soon discovered this was not a particularly handy arrangement. As you operate the switches you have to flip it around the look at the back, then back to the front to look at the display. 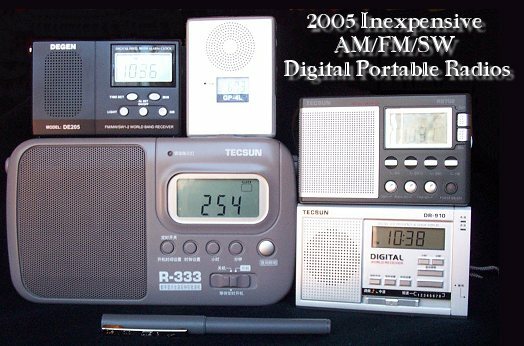 The first radio I tried was the largest…the Tecsun R-333. Unfortunately, I couldn’t get it to power up. It was completely dead…no display…no nothing. Although it is a simple radio, it is labeled in Chinese and I wondered if I was missing something. (The manual is also in Chinese). After trying every conceivable combination I gave the side a good rap and on came the display and a burst of static. I started to tune around but before I could find a station of any kind it went dead again. Fairly well frustrated at this point I opened the case…it was straight-forward with 6 screws on the back panel. What I found was that the bottom spring in the battery compartment was compressed completely flat as if it had never been stretched out into the familiar spiral shape and thus wasn’t contacting the bottom end of the battery. It was a simple matter to carefully stretch it open a bit…since then the radio has operated perfectly. It’s interesting though, that such a part could have been installed in the first place and never have been discovered in any kind of final check…it clearly did not happen in transit. I mention this detail in case this problem affects more than my sample of this model because it’s easy to fix if you know what to look for. I put new alkaline batteries in all the portables and proceeded to get to know them. All of these radios run on 2 AA cells except the R-333 which runs on 3 D cells. 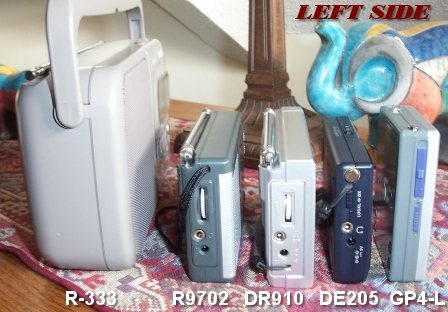 Interestingly, although none of these models is supplied with an ac adapter, they all have DC input jacks except for the R-333. My guess is that the 3 D cells in that radio should power it for months on end even with heavy daily use. I also have to say that the R-333 is clearly not exactly comparable to the others in this group, so in some ways it’s not fair to compare them. As I mentioned earlier, I selected these radios because they were the least expensive digital readout radios I could find. After seeing them together it’s obvious that the R-333 will find it’s best application as a casual, around-the-house radio. It has stronger performance than any of the smaller sets, both in terms of reception and sound quality. The smaller sets sacrifice some of that performance, but in return offer you maximum portability, down to shirt pocket size if that’s what you want. Your first decision, then, is how you want to use the radio. Beyond that I compared all the radios directly to one another so you can see how they ranked in different aspects of performance. My initial tests were at mid day…the best time to check for weak signal sensitivity…to me one of the most important criteria for a portable radio. By tuning each radio successively to a variety of signals I got the feel of each one quickly, and tabulated my listening results. * (On the 6000 MHz station (Radio Havana Cuba) the GP-4L and DE205 could not pick the signal out of the jumble of signals near that frequency). In general it is clear that the smallest two radios (GP-4L and DE205) were weaker performers than the next size up (R9702 and DR-910), which in turn fell somewhat behind the larger R-333. As a point of reference I also compared all the above against some betterportables to see how this group compared with more sophisticated radios. Not surprisingly the pricier radios offered much more sensitivity, selectivity, fuller sound and were generally easier to operate than the inexpensive portables. However, it was good to see these inexpensive models weren’t horrible by comparison. The R-333 gave a reasonable showing against the reference portables as long as the signals weren’t too difficult, which means it is a good value. The smaller radios gave up more sensitivity, but were still able to deliver reasonable reception on average to strong signals. Also the GP-4L and DE205 were quite disappointing on AM with such poor sensitivity I would say they are only listenable with fairly strong signals. Each of these models has a single bandwidth which is adequate to separate typical AM broadcast stations at night time…I was able to tune adjacent frequencies, one after the other on all of the radios fairly well. They each exhibited some heterodyne squeals and various other noises around some signals, and the variations were somewhat random from radio to radio. That is, one radio might have a bit of a whine on 710, while another might be clear on 710 but have a whine on a different frequency. It also became evident that the DR-910 has a slightly wider bandwidth filter which caused it to exhibit some noises on crowded AM and SW frequencies which the R9702 handled better. On shortwave selectivity becomes more of an issue…as you tune around crowded bands at night the stations tend to run into one another and the ones you can listen to are the ones strong enough to poke through. Again, pretty much as you would expect in an entry level radio. The stronger majors will be there for sure but don’t expect to find many weaker signals in between. Also remember that reception will usually be best while you are holding the radio…your body acting as a counter poise or ground reference… part of the radio’s antenna system. I didn’t compare FM reception quite the same way as with AM and SW, but paid more attention to reception and sound quality on the stations that typically come in well in my area. In my suburban location I am about 10-15 miles from most of the FM transmitter sites so I receive ample but not overloading signals. The Tecsun R9702 and Eton/Grundig G1000A provide stereo to the headphone jack. The DR-910 however, and the other tested models do not. Sound quality was decent on all the models in ear buds although not in the same league as a serious walkman or mp3 player. Through their tiny speakers they all sounded tiny, except the larger R-333 which sounded natural and surprisingly powerful. The march of technology is nowhere more evident that in this batch of inexpensive world band portables, all of which offer digital frequency readout. The features and performance they offer vary from one model to the next, but as a group they represent a value that wouldn’t have been available anywhere near this price even a few years ago. While there are many analog portables available for under $50 (Kaito WRX-911, Sangean SG-622, Tecsun R-9700 and the Degen DE-312 to name just a few), the digital readout alone makes these latest additions all a bit easier to use. The fact that they can be marketed at these prices shows that innovation is proceeding at a fast pace. It also means that many models in the next price tier up ($50 to $100) are challenging our notions of what kind of performance and quality can be had at that price level, with models from Degen and Tecsun/Eton/Grundig providing real value for the dollar, while other companies who formerly dominated the field (Sony and Sangean) seem to have given up or lost the competition. 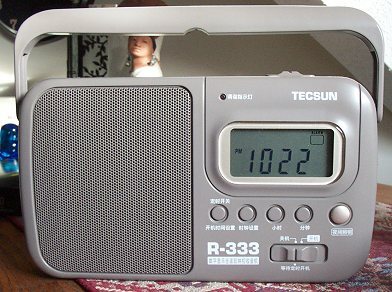 In this group the Tecsun R-333′s size separates it from the other radios…it’s not as convenient for travel as the smaller units but is the clear choice for general in home listening. It is followed in size and performance by the Tecsun DR-910 and R9702. These two sets are the same size and close in price and overall performance. However they have quite different “personalities”. The dual conversion R9702 resists some forms of interference just a tad better than the DR-910. It also has a slightly narrower apparent if bandwidth which means as you tune around you seem to get less squealing and less heterodyne interference on some stations. 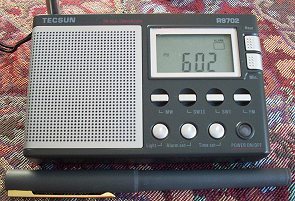 The DR-910 is easier to tune on SW because of its 8 shortwave bands while the R9702 tunes the shortwave spectrum in two continuous bands. Yet the R9702 is easier to tune on AM and FM, and scanning the AM bands at night it does slightly better at separating adjacent frequencies without interference. Overall the R9702 has a slight edge in performance over the DR-910 and also offers FM stereo. That leaves the two smallest radios, the Degen DE205 and CountyComm GP-4L. These sub-compact or pocket portables aren’t intended to snag faint signals from the ether…that is the job of their more sophisticated bigger brothers and sisters. These small, inexpensive radios exist to let you bring your world of shortwave, AM or FM along with you almost anywhere with the least amount of effort, so no matter where you may roam you need never feel disconnected. They can be lots of fun to play with and just tune around at times when you might not be able to have a larger radio available at all. As long as you realize that they are only for reasonably strong signals you won’t be disappointed. 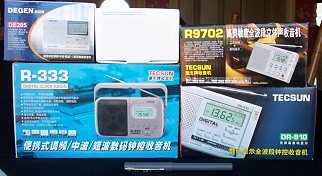 The radios reviewed in this article came from three sources: a supplier who ships to most of the world directly from China; a seller who imports the radios to the US then ships from there; a US Distributor. 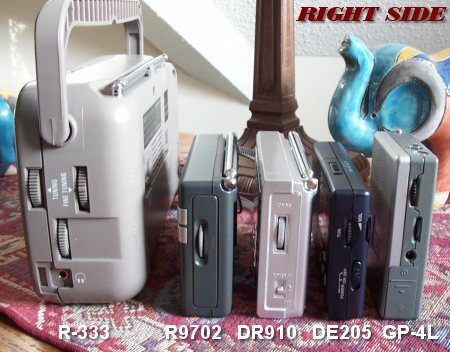 In this particular group only the Tecsun DR-910 (imported as the Eton/Grundig G1000A) and CountyComm GP-4L are available through a U.S. retailer… the others are only available in their Degen & Tecsun OEM versions. Still it is good to be aware of the ins and outs of buying directly from the source versus through an authorized distributor in your country. The biggest differences deal with problem resolution and warranty coverage. Although the radio will have a Manufacturer’s or Seller’s Warranty and will be repaired or (usually) replaced for no charge during the initial ownership period, the owner will be responsible for shipping charges, often in both directions. At the price level of the radios reviewed here this can equal or exceed the cost of a new one. Therefore you should be aware that in exchange for getting a great price…perhaps half of what you might pay for the officially imported version, if you do have a problem or receive a defective unit you might want to just consider it a loss and start over. It is often worth taking the risk as most of the radios should experience no problems, but many buyers don’t grasp this concept and then become angry when they don’t receive a free exchange or refund. 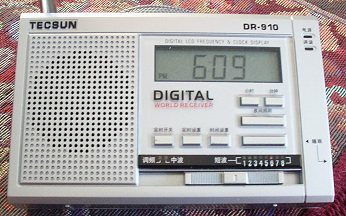 There are a few ways the Chinese version may differ from an officially imported version of a radio. Documentation: You may receive only a Chinese language owner’s manual. On these basic receivers that’s not much of an issue. On more expensive models the sellers often offer English translations of the manuals at no charge to their customers. Sometimes you can download the English version of a manual if the model is also imported to your country, as in the case of the DR-910/G1000A discussed earlier. Some Chinese models are marked in Chinese. Again, not a big issue with these basic sets, but it can be an inconvenience with more complex radios. Frequency Coverage: Many Chinese versions omit the Expanded AM band up to 1710 kHz. If this is important to you, check the specs from the online sellers or stick with the US version. (The radios in this review all omit the expanded band except the CountyComm which is the only US Import version in this group). A/C Requirements: If the radio comes with an ac adapter or charger, the Chinese version won’t work in the US without either a “120 to 220″ AC voltage adapter or a replacement of the 220 volt AC wall wart with a 120 volt model. FM Stereo or Mono? This is the first time I’ve seen this, but while the Tecsun DR-910 does not offer FM Stereo the Grundig G1000A does. It pays to read the fine print.